As a songwriter, every experience in life – both good and bad – provides material that can be worked into a tune. As an American, nothing makes you appreciate freedom like days spent in another country that has none. 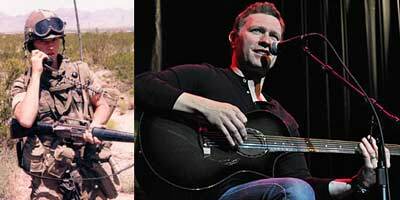 Country music star Craig Morgan spent 10 years of active duty in the U.S. Army and almost another decade in the Army Reserve. "It would be easier to tell you the places I haven't been," said Morgan in answering a question about his military history. That experience has left Morgan with a special perspective on the freedom we enjoy, but don't appreciate enough, in the United States of America. July 4th is the one day each year when Americans celebrate freedom. That time comes a bit more often for Morgan. "Every day is the Fourth of July in my world," he said. "It's really hard to grasp how fortunate we are in this country until you see those that are so much less fortunate. I've seen it and experienced it first hand." That's what separates Morgan from many others in the music world. He writes and performs songs based on a wealth of experience amassed in his 47 years. Morgan's song "Paradise," co-written with Harley Allen, is a perfect example. It came as a result of Morgan being stationed in Panama with the Army's 82nd Airborne Division as part of "Operation Just Cause," which began December 20, 1989, and ended 42 days later, after the U.S. captured Panamanian dictator Manuel Noriega. Twenty-three U.S. troops were killed in that encounter; another 325 were wounded. Morgan has been described as what you get when you cross a soldier with a country music singer. Because he has been there, he keeps giving back. The former Army staff sergeant has performed for U.S. troops overseas nine times. In 2006 he received the U.S.O. Merit Award for his efforts. The list of U.S.O Merit Award winners also includes movie director Stephen Spielberg and the late Bob Hope, whose overseas entertainment of U.S. troops is legendary. Morgan was one of the first to entertain troops in Afghanistan, after the U.S. invasion in 2001. "They were still sweeping up glass at the Kandahar airport," Morgan said. "It's hard for people to even fathom the lifestyle in that country. If you can imagine being stranded on a desert island, to me that's about what Afghanistan is like." When Morgan was growing up in Kingston Springs, Tenn., near Nashville, he dreamed of being a war hero rather than a country music star. Even though his father played bass guitar in country band, it was becoming a songwriter, rather than a performer, that ultimately attracted Morgan to the music business. "I knew you could make money writing songs, where, as an artist, it's really difficult," he said. "Very few people make it in that world. I didn't expect to be an artist." But if you can write songs, you improve considerably your chances of performing them. The secret of Morgan's success can be traced to his wide range of experience. In addition to his military service, Morgan has been employed as an emergency medical technician, a Wal-Mart assistant manager, a deputy sheriff and a construction worker. Added to that wide-ranging work experience is Morgan's love of hunting and fishing, in particular, and a lust for life, in general. He continues to compete on a "dirt bike" motorcycle racing circuit. Morgan, obviously, never fit the mold of fast-rising, young music phenom. He was a married father of five children before his he had his first top 10 hit on the U.S. country music charts – "Almost Home" in 2003, which remains his signature song, at least in his eyes. "It's the song that kind of made things happen for me," Morgan said. "It's a song that will be one of those classics. I've received more accolades for that song than anything I've ever written." Co-written with Kerry Kurt Phillips, the song's accolades included a "Song of the Year" award from BMI and a Songwriter's Achievement Award from the Nashville Songwriters' Association International. It tells of a winter encounter with an old man who is sleeping behind a trashcan. The homeless man, awakened by an offer of help, expresses his wish to be left alone. And like many of his songs, it draws on Morgan's youth, when his love for the outdoors left many memories. 'Cause I was almost home"
Morgan, who was inducted into the Grand Ole Opry in 2008, now has 14 top 10 country music songs to his credit, ranging from "Redneck Yacht Club" to "That's What I Love About Sunday." He has been married for 23 years now and no longer has the day-to-day worries of providing for his family. But at a time when others might think about slowing down, Morgan appears to be striding into his prime and enjoying every hard-working minute of it. In addition to his success in the music world, he has an award-winning TV show on the Outdoor Channel – "All Access Outdoors," which began its third season on July 1. And Morgan is considering expanding his workload. He's seriously pondering publishing a book. His dedication to entertaining U.S. troops has provided another deep source of stories to tell. When asked to single out a couple of the heroes he's met, Morgan refused, saying, "There are so many. It would be hard for me to tell you one because I'd be doing an injustice to all the people I've met, all the stories I have. "It's going to make a great book some day." Morgan already has a title in mind: "Who Cares"
"It's a statement, not a question," Morgan said. It would be one more testament to a man who revels in the art of storytelling. And it's the stories about freedom that Morgan enjoys telling the most. That only makes sense for a man who celebrates the Fourth of July every day of the year.